My tiny little space for baking might be more hazardous than most. Because it’s so small, every cupboard in the kitchen is crammed to its limit, herbs and spices jostling for space with packets of pulses and only one dedicated place to keep all my baking ingredients. It’s not that I haven’t tried to encroach on other cupboards, but after storing chocolate in the same place as curry powder resulted in it taking on a strangely spicy flavour, I’ve returned to a single space to store my flour, sugar, chocolate, nuts and syrups for fear of cross contamination. Situated above the sink with an upwards opening door that doesn’t stay open by itself, my baking cupboard is an accident just waiting to happen. Every month or so I’ll rearrange it, moving everyday items like flour and sugar to within easy reach while lesser used items like food colouring, fondant or tins of treacle are tucked further from the front. But, like my carefully arranged clothes cupboards, every couple of weeks the rearrangement falls apart, packets rammed in at all sorts of angles, propped up precariously and waiting for their moment to explode out of the cupboard and onto my head in a snowfall of flour or sugar. Last week I opened the cupboard to a cascade of flaked almonds falling out of a half opened packet that I’d failed to sellotape shut, followed closely by a packet of ground almonds which luckily I hadn’t. As I scooped the – now soggy – almonds from the sink I made two resolutions. The first, and one I’m bound to break, being to keep my cupboards in better order. The second, and something I’m hoping will be easier to stick to: to start using up some of the random assortment of leftover ingredients I seem to accumulate on a weekly basis. That means the half opened jars of nut butter, numerous packets of nuts, oils and essences, syrups, sugars and seeds which seem to have made their way into my cupboards over the years. Food waste is most obvious when it’s something thrown from the fridge or scraped from your plate, but I also hate the thought of all those expensive ingredients languishing out of sight in hidden corners of the kitchen, not getting used until it’s a year too late and they’ve gone out of date. I like the idea that this dessert was created from leftovers. After making this custard based honey and pistachio ice cream, I had five egg whites to use up so knew I wanted to make something meringue based when my brother came round for supper this Saturday. Having experimented with a peanut based dacquoise, I decided to use up a half opened packet of ground almonds in an almond version, scattering over flaked almonds for added crunch and colour. The filling is made from cream (which I always have on hand), lemon curd – a half-eaten jar of which was sitting at the back of the fridge – and the remaining mascarpone from some tartlets we’d eaten earlier in the week. Add a dusting of icing sugar and the blackberries I hadn’t got around to finishing for breakfast and the whole thing started to come together. It might seem a bit laborious to make two different types of meringue, but the filling is so simple I’d argue that it’s worth it. I spent all weekend out the house on a course and still managed to throw this together in time for dinner on Saturday, the only thing that took a little time being decorating the edges with flaked almonds. It’s a case of minimal effort creating maximum impact for a dessert that’s pretty to look at and delicious to eat, crispy, chewy layers yielding into smooth, sweet cream with a toasty crunch of almond and a burst of juice as each blackberry bursts in your mouth. Make this dessert on the day you plan to eat it – the longer the toasted almonds sit against all that whipped cream the less likely they are to retain their nutty crunch. I’ve guessed that it should serve approximately 8 – 10 people below, based on the fact that Carniverous Boyfriend, my brother and I ate two generous slices each with a little left over. If your family is less greedy than mine, it might stretch slightly further. Preheat the oven to 170 degrees C. Line two trays with baking parchment. Whisk the egg whites, sugar and salt in an electric stand mixer until still peaks form. Spoon one third of the whipped egg whites into a separate clean bowl. Fold the ground almonds into the other two thirds of whipped egg white, working lightly until combined. Transfer the ground almond mixture to a piping bag fitted with a plain nozzle and pipe two 30 x 16cm rectangles side-by-side on one sheet of baking parchment, making sure you use up all the mixture. Sprinkle flaked almonds over one of the rectangles. Refill the piping bag with your plain meringue mixture and pipe one more 30 x 16cm rectangle on the second sheet of baking parchment. Bake for 35 – 40 minutes until firm to the touch and golden brown. 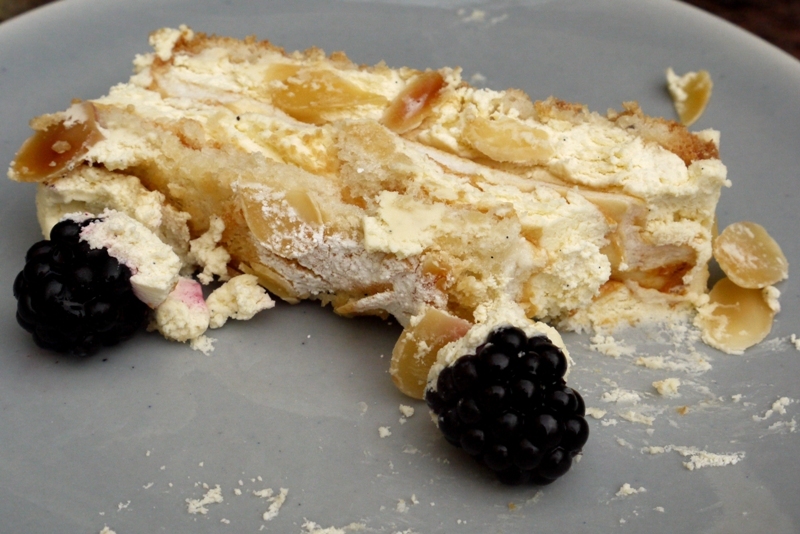 Your plain meringue might need a little longer than the dacquoise. Remove from the oven and allow to cool. Whip the double cream until medium peaks form – you want it to hold its shape without being overwhipped. Divide between two bowls and stir the mascarpone and lemon curd through one bowl and the vanilla and icing sugar through the other. 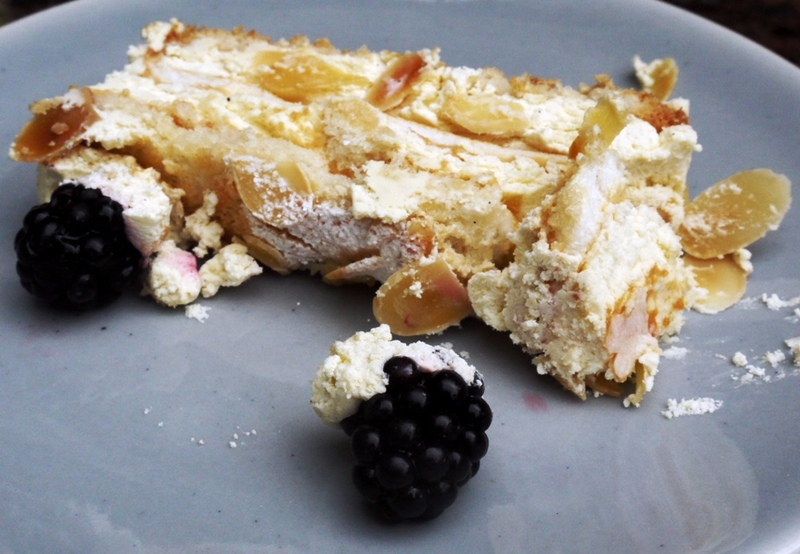 Place the plain rectangle of almond dacquoise on a serving plate or cake board. Fill a piping bag with the plain cream mixture and pipe over the rectangle. Top with the plain meringue rectangle. Refill the piping bag with the lemon cream mixture and pipe over the second layer. 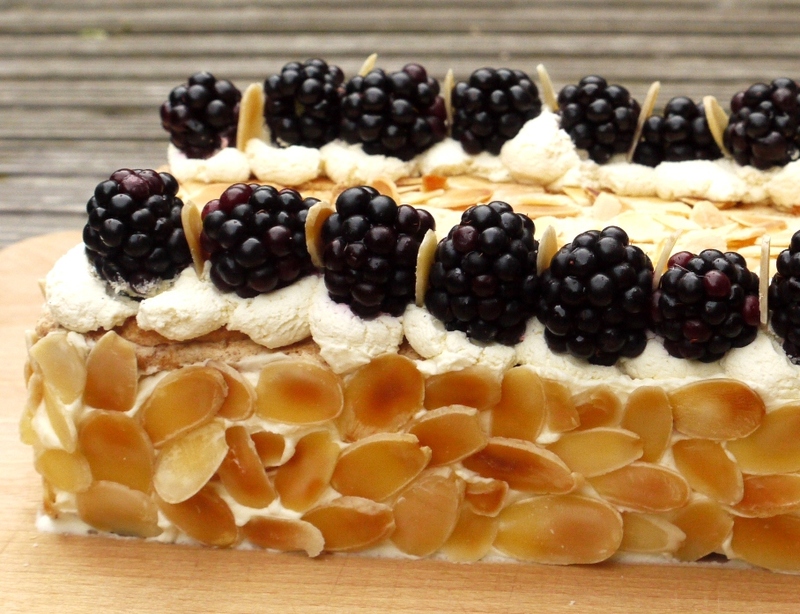 Top with the flaked almond dacquoise rectangle. Pipe a very thin layer of cream around the edges of the layered meringue and smooth flat with a palette knife. Press flaked almonds into this layer of cream, working round the entire cake until all the sides are coated. Pipe dots of cream along either side of the top meringue and top each one with a single blackberry. Dust with icing sugar and serve. This looks way delicious! Such a lovely job. My loaves always end up looking messy! Your kitchen sounds eerily similar to mine. Every time I’m in there, I tell myself that I’m going to keep it more organised and it never seems to happen. I tell myself that I would be better if I had a bigger kitchen but I know that would just encourage the mess to spread! Anyway, I’m a big fan of using up bits and pieces and this looks like a far more fancy alternative than what I usually come up with! A lovely combination of flavours. the slice looks beautiful too. I did something similar recently and I do think it doesn’t matter the size of the kitchen, everyone ends up with their cupboards in a chaotic mess! You have chosen something quite delicious to make with all of your surplus almonds. I have just used up lots in one of my latest recipes, love them. Love this! My Dear Bakes – thanks! Jess – haha, a lot of people have been saying that! What a wonderful use of leftover ingredients! It’s almost unbelievable as it looks so good – it’s like it was all planned that these ingredients were meant to come together. Only you could make something so stunning from a load of leftovers. and you’re right, it doesn’t look that complicated to make either. This sounds such an interesting combination of flavours, but a jolly delicious one too. I too have a fairly small kitchen and my ingredients have overflowed into other rooms which is not ideal and doesn’t make for a very tidy house either. I tend to keep all my packets in baskets in the cupboard. They are overflowing baskets, but this does keep things contained within certain areas and means I know where to find things – generally! Beautiful, beautiful stuff. I’ll be honest; there are parts of my cupboards that terrify me. Tori – thank you so much. Eileen – the almonds add such a lovely toasty flavour. Big Hungry Gnomes – my pleasure, so pleased you like it. Fabulous dessert. My baking cupboard is above the sink too but, happily, not with an upward opening door ( that doesn’t stay open). I think I’d just take the door off until I could work out how to replace it with something better. That way you’d be forced to look at the chaos that would otherwise remain hidden! OMG…in the cookbook “Baking with Julia’ there is a recipe for a Cardinal Slice that I’ve been dying to try..but I kept thinking..it needs more flavor than vanilla. 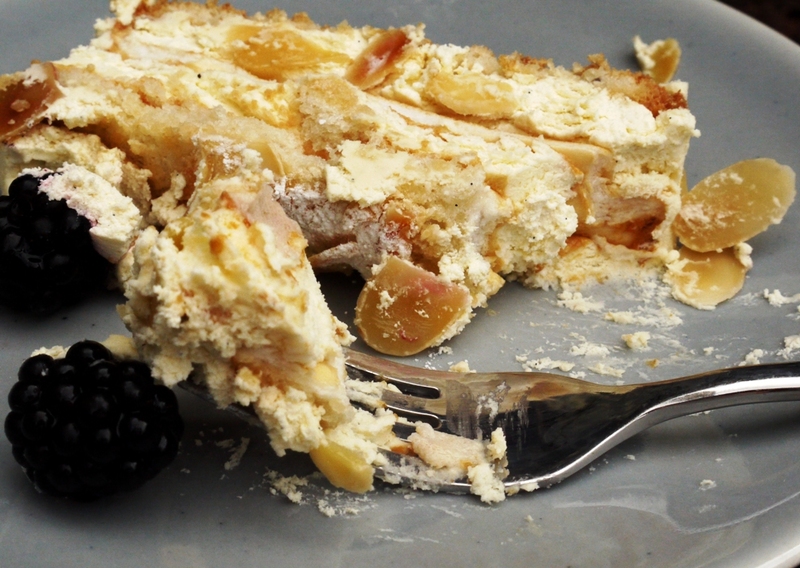 Voila..you just solved that with your gorgeous ..5 star looking Lemon – Blackberry slice! I’m awed and excited to try it! The almonds are placed so perfectly..they look like little, oval bricks! Stunning! Tell me about it, plus I hate clearing up, or washing up – go figure (Americanism), I’m a boy :D… sorry, I meant to say man. 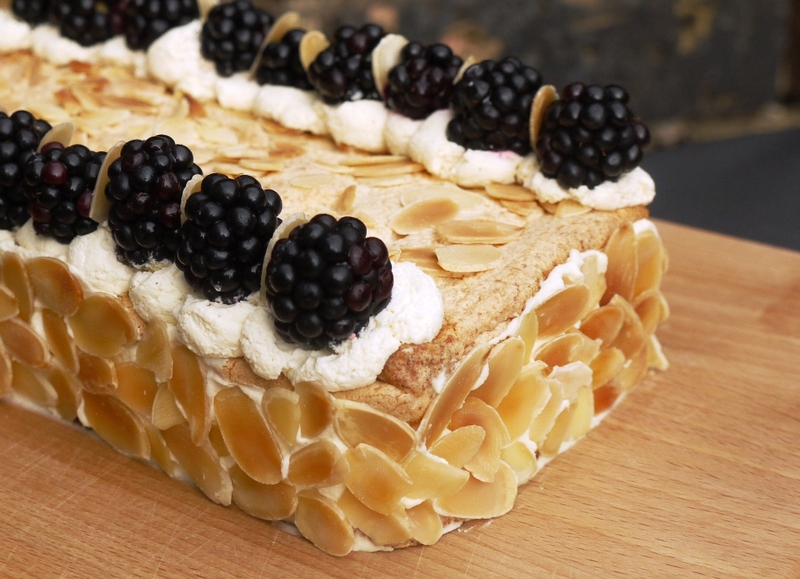 That looks like a truly fantastic slice cake – very prettily decorated. Then again, all your stuff is wonderfully presented. Food Photography & France – ooh no, I definitely need the door on there to hide all the chaos inside! Lisa – hooray! Lemon and meringue is such a classic combination, I’m sure it would be wonderful in your recipe too. Perfect paining – its so pretty too 😀 YUM! I have made a similar resolution to empty my over-crowded cabinets, freezer, etc. My last experiment was disastrous (I added too much freeze dried raspberries to macarons) but you’ve given me inspiration for my next one! I *love* dacquoise. Susan – isn’t dacquoise fab? And so many different flavours you can try. I’d just been thinking about making Dacquoise and then lo and behold I came across your recipe. Looks so pretty, and I’m sure it tasted divine. This is the most elegant bunch of left-overs I’ve ever seen! It’s absolutely BEAUTIFUL!